New Item! Expected to Ship 06-24-2019. Earn up to 12,245 reward points. 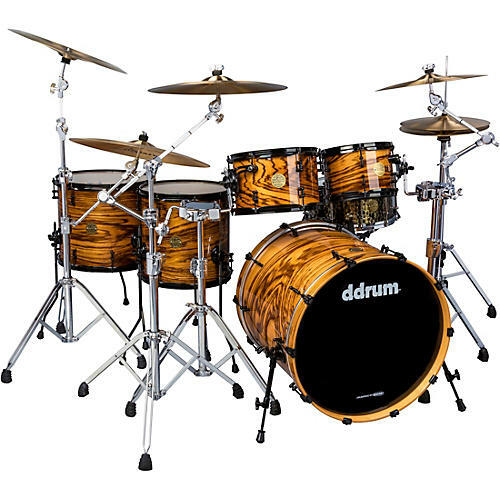 One of ddrum's most eye-catching and well-made shell packs in an expansive 5-piece configuration. If you were ever looking for a kit to make the rest of the band jealous, this is it! The ddrum Dios maple with exotic zebra wood veneer kit packs the perfect amount of style and function that is sure to be the envy of every stage it graces. Thin North American Maple shells deliver the unmistakable sound that the Dios line of drums are known for. The limited edition kit features ddrum proprietary hardware, including our fix pitch mount and patented reso lifts. Partnered with black chrome hardware and classic ddrum bullet tube lugs, this is one kit that needs to be front and center.